THE CURRENT COLD spell will continue until at least Thursday, with below freezing temperatures due tonight. Rain will be seen in the west, spreading over Munster and Connacht by noon, with highest temperatures reaching nine degrees. That heavy and persistent rain will clear early tonight, but will see sub-zero temperatures with frost and some icy patches developing. Tomorrow morning will see the frost gradually clearing but temperatures staying between five and seven degrees, coldest in the north midlands. That cold weather will continue on Thursday with afternoon temperatures of just two to six degrees with light winds increasing in the evening. 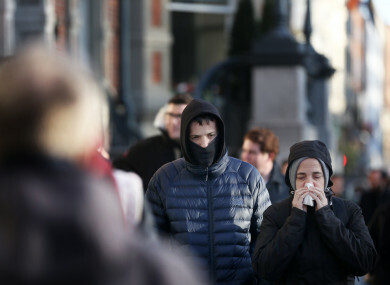 Temperatures on Friday will climb to between six and ten degrees, with Met Éireann saying it will be “milder”. Email “Wrap up warm: Cold snap to last most of the week”. Feedback on “Wrap up warm: Cold snap to last most of the week”.